The North Surrey District School at Anerley, Upper Norwood - a residential school for workhouse children. New! - view a slideshow picture album of the North Surrey District School. An 1844 Act of Parliament allowed Poor Law Unions within a fifteen-mile radius to form a School District to facilitate the setting up of large joint schools for pauper children. Response to the Act was negligible until the disastrous outbreak of cholera at Mr Drouet's privately run pauper school at Tooting at the beginning of 1849 in which almost two hundred children died. In response to the incident, several London School Districts were established. The North Surrey School District was formed on 5th April 1849 and covered the London Unions of Richmond (until 1882), Croydon (until 1884), Kingston (until 1871), Lewisham (until 1930), and Wandsworth and Clapham (until 1930). Chelsea joined in 1850 (until 1876), and Kensington was included from 1870 to 1876. NORTH SURREY INDUSTRIAL SCHOOLS, AT ANERLEY, SURREY. This establishment will be strictly industrial, and no pauper officers or servants will be allowed on the premises. There are three large school and class-rooms, with apartments for school mistresses, school and trade masters, for steward, matron, other officers, and domestics; with dining-room, chapel, chaplain's room (for examining and instructing the children), board-room, cutting-out, work and store-rooms; two receiving wards, with clothes-rooms and baths attached; two kitchens, scullery, servants' hall, and private rooms; bakery, larders, six lavatories, two plunging and other baths; a separate laundry building, with drying, ironing, mangling, and mending rooms; likewise a detached infirmary-building, containing eight wards, nurses' day and night-rooms, surgery, kitchen, washhouse, and laundry. There are also bailiff's house and offices, dairy, cowhouses, and other farm buildings; likewise large gardens; so that the boys will be instructed in trades, farming, and gardening, and the girls in dairy-work. The buildings are to be heated thoroughly throughout by hot water, and thoroughly ventilated by flues and shafts. The boys', girls', and infants' departments are quite distinct; and all the servants in the house are to be women, to allow the girls to be taught baking, cooking, and house-work, and the whole is considered a model for other districts. The main building had an E-shaped layout with a chapel located at the centre and an extension on the west side for an infants' school and residence. There were six detached buildings comprising two probationary wards, an infirmary, two isolation wards, and a small nursery home near the main gates. The site layout is shown on the 1894 map below. The main block contained sixteen dormitories, eight for boys and eight for girls, plus the school and classrooms. The infants' home contained ten dormitories, and the nearby infirmary had seven dormitories for general sickness and ringworm patients. Ringworm was a highly contagious disease of the scalp. Sufferers had a separate school and day-rooms and also washed and bathed separately from the other children. North Surrey District School from the south, 1850. From 1860 to 1866, there was spare capacity at the school and the unions of Newington and St Pancras were allowed to send children there at an agreed rate per head. In 1874, a swimming bath was constructed, with a supply of steam-heated water enabling it to be used all year round. In the same year, an outdoor gymnasium was provided which included a mast and shrouds. A seaman instructor was appointed to instruct the boys and prepare them for further training on the training ship Exmouth. 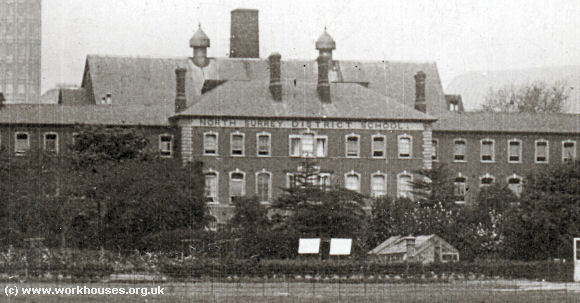 North Surrey District School with the Crystal Palace visible behind, c.1905. North Surrey District School detail, c.1905. In 1930, the site was taken over by the London County Council. It operated as a residential school until its closure in around 1937. The buildings have all been demolished and modern housing now occupies the site. Marlborough House, Broadstairs — opened in 1886 as a home for sick and convalescent children. Wainwright House, Broadstairs — opened in 1891 as a replacement for Marlborough House. A temporary branch school at Bow — operated in 1873-4 during an ophthalmia epidemic. A branch school for infants — operated at South Norwood from March 1912 until December 1920, after which it was purchased by Lewisham Union. A report of a visit to an unnamed District School published in 1866 may be a description of the North Surrey school. 1908 slideshow picture album of the North Surrey District School.